An unheralded player out of a small college, Kelly was taken by the Browns in the eighth round of the 1964 NFL draft (and was completely ignored by the AFL). He saw scant action on offense in his first two seasons, with star FB Jim Brown and HB Ernie Green starting in the backfield. As a kick returner, he led the NFL in punt returning in 1965 (15.6 avg.). 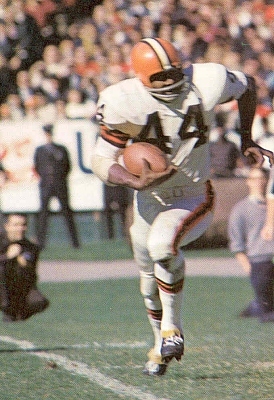 The sudden retirement of Brown just prior to the opening of training camp in ’66 opened up a spot for Kelly in the backfield as he became the starting halfback and Green was shifted to fullback. The virtually-unknown Kelly rose to the occasion, nearly leading the league in rushing with 1141 yards while having the best yards-per-carry average (5.5), catching 32 passes for 366 more yards, and scoring a total of 16 TDs. He was a consensus first-team All-Pro and gained selection to the Pro Bowl. Kelly followed up by winning the league rushing title in 1967 (1205 yards), again with the highest average gain-per-carry (5.1). His 1487 yards from scrimmage also led the NFL and he was again a first-team All-Pro and Pro Bowl choice. Browns went 10-4 to finish first in the Century Division while ranking third in the NFL in rushing yards (2031), scoring (394 points), and TDs (49). Won Eastern Conference Championship over Dallas Cowboys (31-20). Lost NFL Championship to Baltimore Colts (34-0). While Kelly never again had a thousand-yard rushing season, he remained productive, gaining over 800 yards in three of the next four years as well as over a thousand yards from scrimmage. In all, he was selected to six straight Pro Bowls through 1971. His career ended in 1974 as a member of the WFL’s Chicago Fire, gaining 315 yards on the ground and catching 8 passes for 128 more yards. Upon leaving the NFL, he ranked fourth all-time with 7274 rushing yards and sixth in touchdowns with 90. Kelly also caught 190 passes for 2281 yards and gained 12,329 total yards. He was inducted into the Pro Football Hall of Fame, Class of 1994.